The Monroe County Office Building is a testimony to the proud history and growth of Monroe County and the City of Rochester. Formerly the courthouse for Monroe County, the County Office Building became the seat of county government in 1964 when the courts moved to the newly constructed Hall of Justice. The present County Office Building is actually the third structure built at its location of 39 W. Main St.. The first structure built was a courthouse in 1822, a year after the birth of Monroe County. Costing $6,700, the first courthouse also was home to the offices of Monroe County and the Village of Rochesterville. In 1851, due to tremendous growth in the community, a new three-story courthouse was constructed. Built from brick molded at Cobb’s Hill by Gideon Cobb, one of our community’s first business leaders, the second courthouse cost $76,000. Building. (Photo from the Albert R.
The second courthouse feature many architectural wonders. The foundation, steps and pavement of the portico—a covered walk supported by columns—were made of Onondaga limestone. In addition, four pillars stood majestically at the entrance while a wooden statue of “Justice” crowned the dome on the roof. 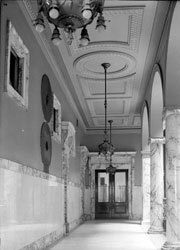 Many of these features have been reinterpreted and are part of the current County Office Building. On Independence Day, 1894, community leaders, responding to the continued tremendous growth in Monroe County, laid the cornerstone for the current Monroe County Office Building. Two years and $881,000 later, the four-story granite and marble courthouse was complete. Designed by J. Foster Warner in the style of the Italian Renaissance, the newest County Office Building set the trend for much of the development in Downtown Rochester that would follow. Never content with the building, a decision was made to construct a rear addition to the building in 1924, upping its total cost to $1,201,000. Watched over by a rare, unblindfolded statue of Justice, the exterior of the County Office Building is made of light-gray New Hampshire granite. According to popular belief, a French sculptor who was wandering through Rochester at the time the second courthouse was under construction carved the gold-painted wooden statue of Justice. The artist was so enamored with his “Lady with the Scales” he couldn’t bear to cover her eyes with the traditional blindfold. So today she continues to glaze eternally over the city. The cornerstone of the building, set on the corner of Main and Fitzhugh Streets, displays the dates of all three courthouses constructed on the site. Also, the county’s namesake, James Monroe, the fifth President of the United States is honored with a marker above the cornerstone. The extension on the rear of the building houses portions of the County Clerk’s Office and the Board of Elections, and may be easily viewed from Fitzhugh Street. The Italian Renaissance architecture that is the County Office Building’s hallmark becomes immediately evident as you enter. On the east wall of the foyer there is a plaque commemorating the committee that spearheaded the building’s construction, and on the west wall is a plaque dedicated to those who donated the building’s site to the county—Rochester’s forefathers: Nathaniel Rochester, Charles Carroll and William Fitzhugh. The building’s focal point is its center atrium featuring Italian marble walls and columns that rise the entire four floors to the main skylight 100 feet above. Intricate wrought iron railings and brass fixtures grace each floor and the marble stairway that winds throughout the building. Upon entering the first floor, the County Executive’s Office is to your immediate left, on the east side of the building. The Monroe Room, named in honor of James Monroe, serves as the reception area. A portrait of this famous president hangs on above the ornate fireplace. Former County Manager Gordon Howe commissioned a local artist, Stanley J. Gordon, to paint the portrait, a copy of a painting that hangs in the National Art Gallery in Washington, D.C.